A grey Sunday morning met the competitors with about 8knots of breeze from 215 degrees. Being aware that big Fast 40's draw some 3 metres and the neap tide was still ebbing, CRO Kathy Smalley set up camp in the vicinity of Royal Southern buoy 4S. A windward mark of Mike Till 4E was set and, depending on the class, marks with plenty of water round them were used including 8N a black inflatable 0.6 nm SE of Hill Head. The navigator's on the Fast 40's were shaken to their carbon fibre cores, having to change their tablets to look for tidal gates, instead of leeward gates. Soon the Solent was peppered with coloured downwind sails approaching from various directions, all destined to finish at hamblewinterseries.com 4J. Night Owl 2, Tony Lambert won Class 1. 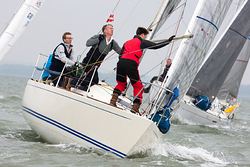 Class 2 saw Simon Perry's J109, Jiraffe in first, whilst in Class 3, Upstart, J92s, Robin Stevenson got in first. 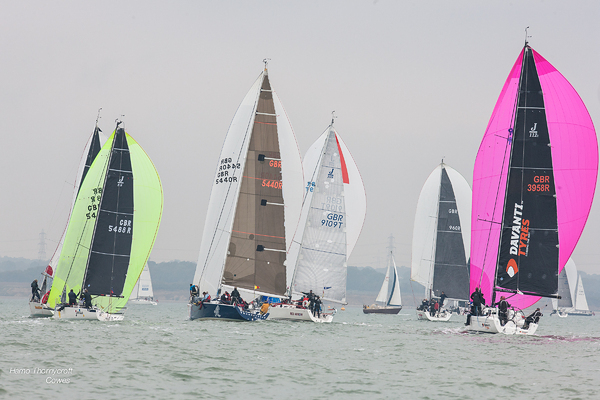 J88, 2688, led the field and in Class 4, Stan the Boat, Sigma 33, Toby Gorman had his first win of the series. For Race 2, Classes 0 & 1 were despatched to chase the F40+'s to West Bramble whilst 2, 3, 4 and the J88's headed for East Bramble. By now the tide was heading South East with some purpose which made the start line interesting. It has become popular to Ping (whatever that means) the start line at both the Committee Boat end and the Pin. On With Alacrity, Sigma 38, Chris and Vanessa Choules, that wily old fox Phil Meakins was driving for the day. No pinging for him, just shoot the breeze on the line, do a couple of tacks and hold up on the tide until everyone else had drifted off towards Ryde. Clear air and to windward of the fleet – mark one eyeball! Once again, the different classes proceeded on their different tours of the Bramble Bank. 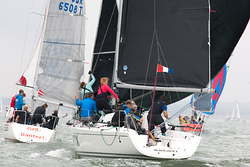 As with Race 1, all were to finish at hamblewinterseries.com. However, with the breeze softening, and following a committee boat committee meeting, the smaller classes were shortened to East Knoll. A very popular decision all round. The wind did of course fill in again but nobody cared. 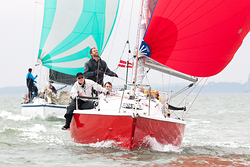 The Farr 40 Thunderbird, Rupert Wolloshin, continued its unopposed mastery of Class 0. Down in Class 1 however, change was afoot with the new J112e, Devanti Tyres, Chaz Ivill, taking its second first of the series. Class 2, had Jiraffe making it two for the day and in Class 3, Machismo 11, Sigma 38, Tim Levett, saved his time to win. With Alacrity, down in 7th, was unable to capitalise on her excellent start. 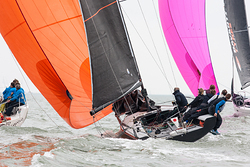 Respect, Mustang 30 Mk2, Stuart Danby, got back to winning ways in Class 4, whilst the J88 with no name (2688) made it two in a row. Day prizes were presented by HRSC to all on the podium, and a beautiful Hedley Bewes half model went to Sir Keith Mills and the crew of Invictus for their series win the Fast 40+ Class. 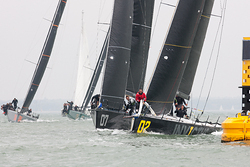 It's rumoured that the Fast 40 crews shifted the barrel of 6X in record time. They will of course be welcome back. 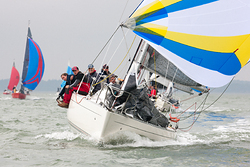 Next weekend sees the climax of the Hamble One Design Championship and day 4 the Hamble Winter Series.